Back in June I visited London to attend IMATS, and of course walked away with a great deal of beauty and makeup goodies. 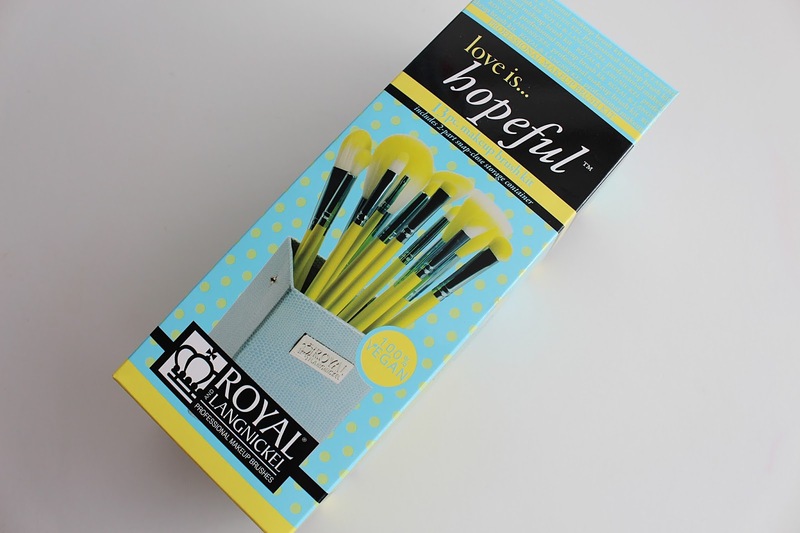 One of which was the 13 Piece Brush Set from Royal & Langnickel, a brand I haven't previously tried, but after a quick stroke of the brushes at the stand I was happy to part with my pennies and give these beauties a go. I've been using them for a couple of months now and thought it was about time I gave you my views on these beautiful brushes. First of all - they are just that, beautiful. 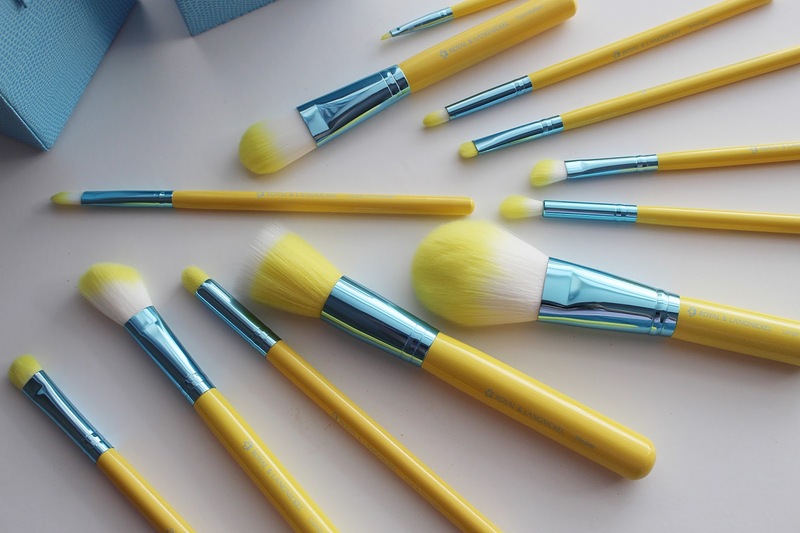 In a gorgeous pastel blue box, each of the brushes is a stunning baby blue and yellow, which look perfect sitting on my makeup station. 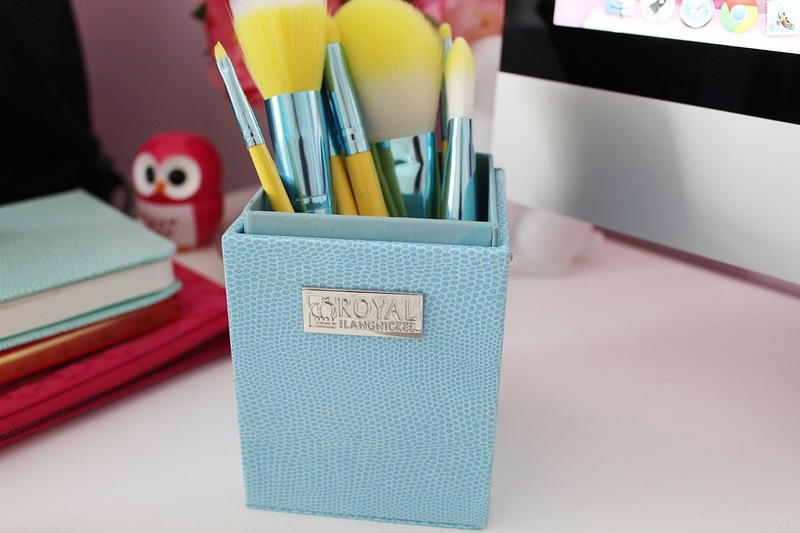 The box they come in is really good quality and a great idea to keep your brushes safe, as it comes with a lid as well. They also had brush wraps available but I much preferred the box option. The variety of brushes in the set is great - there is literally everything you would ever need in there to apply a full face of makeup. It comes complete with a powder brush, contour brush, foundation brush, large concealer brush, stippling brush, mini flat smudger brush, small shader, line & smudge brush, smudger brush, crease brush, angle shader and angle brow. Phew! A whole load of brushes, ideal for those just starting out with makeup, or anyone wanting to upgrade their current brush collection. Each and every one of the brushes is 100% vegan and uses synthetic hair - something I always look for when buying makeup brushes. The are ridiculously soft, don't shed and are a dream to use. The plethora of different eye brushes has opened the doors for me when it comes to creating different eye makeup looks, and the wide selection of different face brushes means I'm never short on applying my foundation, powder etc. I paid £25 for the kit, which was a one-off price for IMATS. Usually it costs around £50 so I got a real bargain on the day, but I'd say if you have the money and are looking for some new brushes, it's definitely worth the splurge. I've hunted online to see if I could find them available in the UK and they don't appear to be on the UK site - but they are on the US site if this helps. If anyone knows if/where they're available in the UK if you could let me know in the comments that would be amazing! 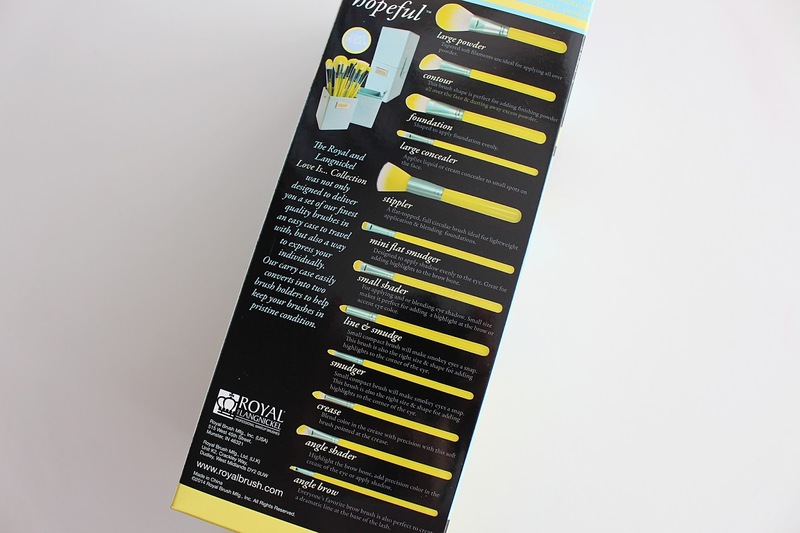 Have you tried Royal & Langnickel's brushes before?